Providing section slate beds with commercial quality playability, the complete Buffalo range provides an excellent entry point to American Pool. Finance available, subject to acceptance. Buffalo Pool Tables offer a superb selection of incredibly competitively priced American Pool Tables. Each model in the range offers stylish design and a commercial standard finish quality, along with excellent playing characteristics. Each Buffalo American Pool Table uses a sectional slate design, as demanded by the world's best pool players. 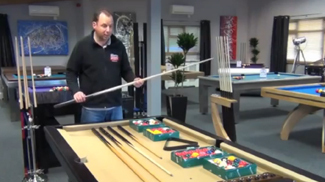 This type of arrangement allows for our professional installers to set your new table up perfectly, with the playing surface completely level, to give you a great game of pool every time you play. An added advantage of the design of the Buffalo tables is that they are supplied in pieces, meaning that if you would like your table to be installed in a difficult to reach location we will probably be able to install a Buffalo table in there. Again, we can offer expert advice on all aspects of your table installation, however tricky it may be. This installation comes completely free with all Buffalo Pool Tables, as well as free delivery. Please note that the installation will be to ground floor locations only, and if you need your table to be installed up or downstairs there will be an extra charge. If you wish to enquire about extra installation charges, please contact one of our sales advisors on 0800 622 6464, and they will be happy to talk through your options. Buffalo Pool Tables are available in a range of finishes with matching cloths, and can be also supplied with a hard top for dining, working or anything else, as well as a table tennis top to allow the table to double as a table tennis table. The beautiful cloth supplied directly by Buffalo completes the look, though if you can't find exactly the colour you want, we can supply Elite Pro Cloth by Hainsworth, or one of our huge range of logo cloths, which include football club logos, Jack Daniel's or any printing of your own design. If you need any help choosing your perfect table, or deciding on colour schemes and finishes, please give one of our expert advisors a call on 0800 622 6464 and we'll be happy to talk through all your options. All Buffalo pool tables are designed to play American Pool, so they are supplied with 2 1/4" American Spots and Stripes balls. Also in the free accessory pack we supply you with two quality American cues, a triangle and chalk. At Home Leisure Direct we supply your Buffalo table with free delivery and installation to most locations within mainland UK. The table will be professionally handled by one of our fully insured specialist two man delivery teams. It will be placed in a ground floor room of your choice, and all packaging removed. This ensures you have the best service from Buffalo and Home Leisure Direct, from the moment you order to the start of your first game. If you are looking for some expert advice, either on Buffalo Pool Tables or on any of our other products, please just give our friendly team of advisors a call on either our freephone number 0800 622 6464, or on our main line number 01454 413636.